Homewood and the rest of the planet suffered a loss last week with the passing of Aretha Franklin, at the age of 76. Just three years ago, she showed that she was still - well, a goddess, basically - when she brought down the house during the Kennedy Center's honoring of Carol King. I don't know what anyone else in Homewood did last Thursday. I spent at least a couple of hours YouTubing Aretha videos. In doing so, I learned about her remarkable and unexpected performance at the 1998 Grammys, when she stepped in for an ailing Luciano Pavarotti and OWNED one of the world's most well-known operatic arias. Now comes the disappointing news that she died without a will or trust. Now the disposition of a reported $80 million will become the focus of a grieving family and the topic of public discussion for who knows how long. This, after the same thing happened with Prince. And with James Brown. Creating paperwork to guide the disposition of one's estate can feel like playing air guitar - an imaginary act that has no impact. But in fact, it is one of the most impactful things a person can do. Likewise, failing to do so is one of the most impactful things a person can do. The impact can go beyond a family to affect an entire community - one big reason that Homewood looks the way it does is because for decades, homeowners have died without wills. Last week, dozens of pieces of real estate in Homewood were offered at the County Treasurer's sale. My guess is that the majority of them were owned by dead people, or by negligent heirs. Shall we top this off with a taste of irony? Okay - August is National Make-A-Will Month. So I'm going to close with this: if you want to do the right thing by everyone and get a will done, without spending hundreds (or thousands) of $$$, shoot me a text at (412) 508-4088. I can help you make that problem go away. The project was produced by members of the Pittsburgh Black Media Federation, the local chapter of the National Association of Black Journalists. The men being honored were selected through a nomination process in which PBMF reached out to the community to ask whom they considered to be heroes. I am one of them. The other 19 include Rashad Byrdsong, founder and CEO of Community Empowerment Association, Neil Dorsey, owner of Dorsey's Records, and James A. Brown, the director of the Homewood-Brushton YMCA's Lighthouse program. The resulting exhibit will be unveiled in a reception at the Homewood-Brushton YMCA on December 3, from 3:30 - 6 pm. The event is free and the public is invited - to get tickets, visit the project's Eventbrite page. "American Heroes" is part of NABJ's Black Male Media Project, #InspireBlackMen, a nationwide effort to inspire, support and develop training and mentorship opportunities for black men working in journalism and media and those who aspire to do so. My grandmother was a nurse at Aliquippa hospital and ran a food bank out of her home. My mother is a recently retired social worker and has volunteered for organizations too numerous to list. Growing up I was often reminded verbally and by example that “we are called to take care of each other.” I grew up knowing what I was expected to do and the woman I was expected to become. 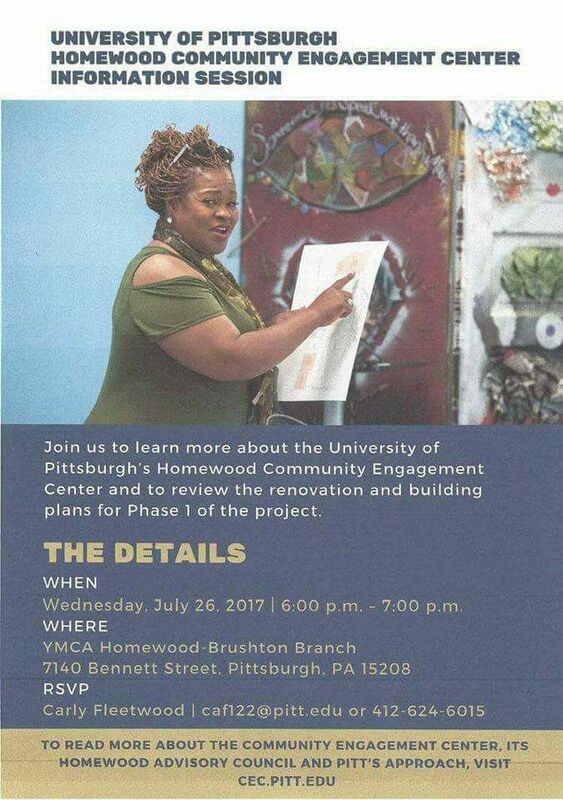 I am the director of Pitt’s Community Engagement Center in Homewood. My mother reminds me that I have been groomed for this opportunity my entire life. It is her words that continue to play out in my head as I approach a month in this new role. I do not take her expectations, and the expectations of the residents living in and around Homewood lightly. The first of its kind in the Pittsburgh region, the CEC (short for community engagement center) is a place-based strategy that helps Pitt be a better partner to the community. It creates a “front door” for Pitt in the neighborhood and is a place where community and university people come together to work on projects and programs. The CEC is different from the organizations already in Homewood and isn’t meant to replicate or replace programming already happening. It’s a place where Pitt can align student projects with community efforts, faculty research with community concerns, and teach Pitt faculty, staff, and students about the history and life of the neighborhood so they can effectively participate in efforts throughout the community. Even though the CEC is new, Pitt’s involvement in Homewood is not, and one of the reasons Pitt wanted to develop its CEC in Homewood was to build on the strong relationships created between the School of Social Work and the Homewood Children’s Village, School of Engineering and the Manufacturing Assistance Center at 7800 Susquehanna Street, and years of community-guided student projects, such as the English Composition class that worked with Mr. Green on this very blog. While the nature of projects and programs of the CEC continue to be refined as we receive community input, we have an opportunity to leverage legal workshops from our School of Law, a diversity of health services (such as occupational therapy, physical therapy, and pre-sport checkups) that complement the services available at Alma Illery Medical Center, and business development and acceleration through our Institute of Entrepreneurial Excellence, just to name a few. My job is to bridge the community and university, and to help identify opportunities for collaboration between the two. It’s important to me that as many people as possible are knowledgeable about the CEC, and that they know the center is accessible to them. Though the CEC will not open until spring 2018, we are arranging a temporary office for me in the neighborhood. Until then, I can often be found at the Everyday Café or the Carnegie Library. You will also see me during many community meetings. Stop by and say hello. I truly want to hear from you! You can also find out more online by visiting our website or following us on Facebook, Twitter, and Instagram. The success of this Center is contingent upon community support and trust. I look forward to building both. Why? Because not only will the community hold me accountable, but my mother most certainly will. I do not want to be on the bad side of either. To reach Ms. Ellerbee, drop her a line at d.ellerbee@pitt.edu, or give her a call at 412-852-7551. If you find value in Homewood Nation, please help it to continue by using the button at the right to make a donation. Thanks! The program is being offered by The Institute for Entrepreneurial Excellence, part of Pitt's Innovation Institute, and is underwritten by The Heinz Endowments. 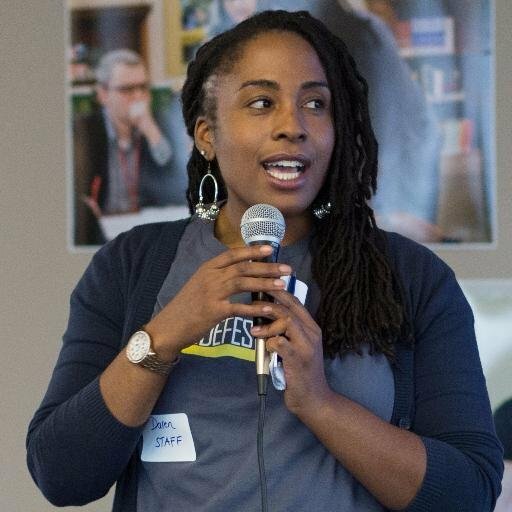 Nicole M. Hudson, program manager for the Institute's Urban and Community Entrepreneurship Program and Entrepreneurial Fellows Class, said that this will be the seventh go-round for the program, which has been offered previously in such locations as Hosanna House in Wilkinsburg and the Riverside Center for Innovation on the North Shore. This time, classes will be held at Bible Center Church, 717 N. Homewood Avenue. "Because of all the revitalization taking place in the Homewood area," she said, "we thought that it would be a great opportunity to work with the local business owners, to make sure that when all these new things take place, that they are ready for that change. "We want people to be able to embrace the change and be prepared for it when it comes." That desire to help business owners be prepared led to an extension of the application deadline, which was originally May 1. The program is open to owners of businesses that have at least one full-time employee other than the themselves, and have been operating for at least two years. The two-page application asks for "approximate annual sales," with check boxes that start at $50,000, but Ms. Hudson said that owners of smaller businesses should not let that throw them off, "as long as you are progressing, and you are moving forward, and you are ambitious, and you are serious about your business." Just above the signature line on the application is a pledge: "If accepted, I am fully committed to attending all sessions and coming prepared to embark on a journey of lifelong learning that will result in the success of my business." As a fan of lifelong learning, I applaud that, and hope everyone who gets into the program does indeed remain on that journey. To apply, download the application form, complete it and return it to Ms. Hudson at nhudson@innovation.pitt.edu.